The Soccer Challenge inflatable game puts players in a competitive mood. Participants take their shoot at the back wall to score a goal through the different openings. The soccer ball then returns to try again. 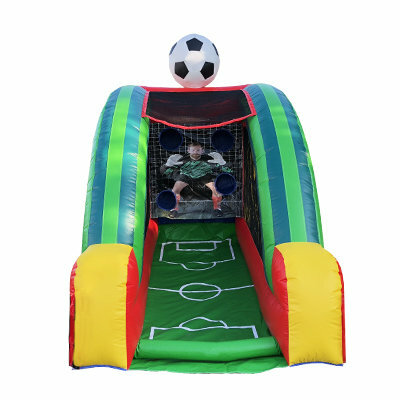 The fast paced inflatable game features "goalie" artwork, a simulated soccer "field", along with a guest attracting 3D soccer ball on the top of the unit. This inflatable game rental would make a great add on for school functions, church fundraisers and corporate picnics. Get your kicking foot ready for this American favorite among the young and old!